very nice condition. professionally maintained by owner. new fork seals and valves just adjusted! 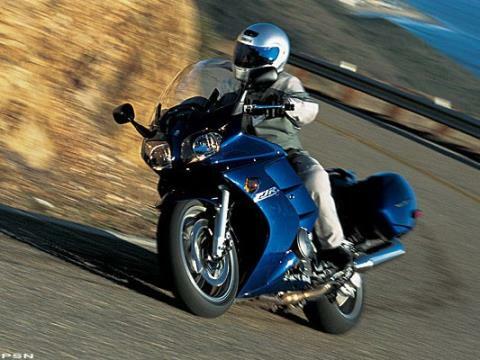 Combining near-superbike power and handling with touring-bike comfort and convenience seemed like such a natural idea, it’s almost surprising that the FJR1300 remains in a class of one. Oh well. 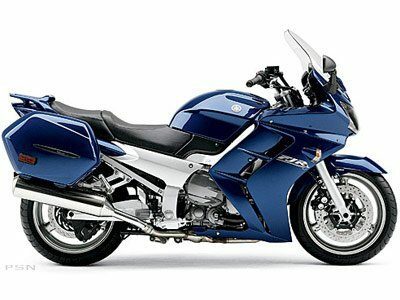 “Supersport Touring” remains an exclusive Yamaha niche, and anyway, the critics seem to understand exactly where we’re going with the FJR1300. 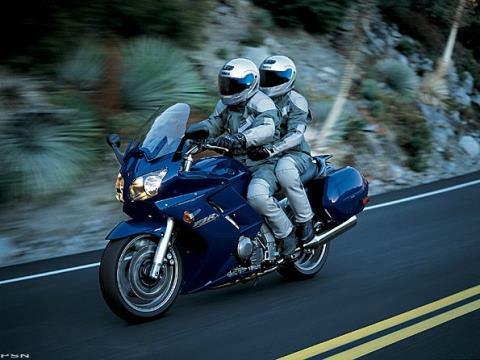 he latest award the FJR1300 has garnered is Cycle World Magazine's 2004 Best Sport-Touring Bike. 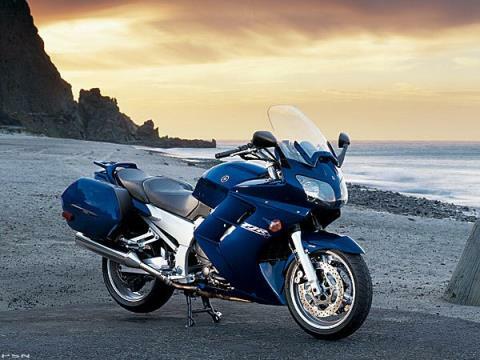 Here's what they had to say - "...with superb luggage, superbike power, fine handling and great riding position, and nothing can touch it for eating all the pavement you care to feed it at a rate that will embarrass any other bike with saddlebags". 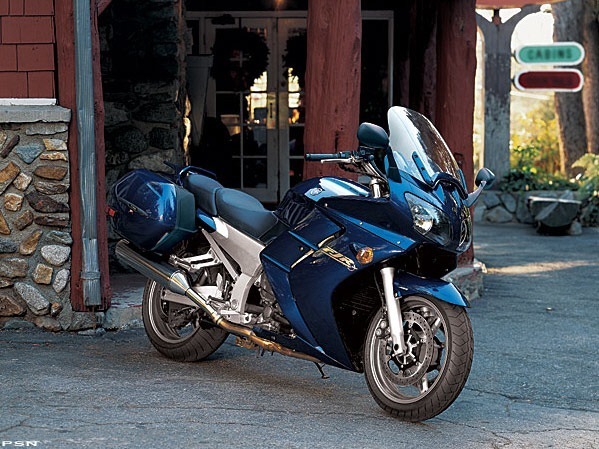 Last season, it was called Motorcyclist Magazine's Tourer of the Year, while it was labeled Rider Magazine's Motorcycle of the Year for 2003. 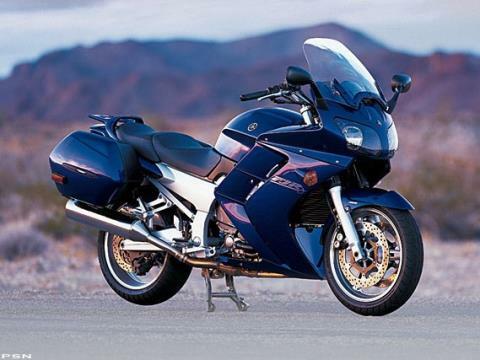 Not to mention, it was Cycle World's 2002 Best Sport-Touring Bike, right out of the gate. ...can all coexist and result in a motorcycle that can attack corners with almost the nimbleness and precision of an all-out sportbike. Downsides? 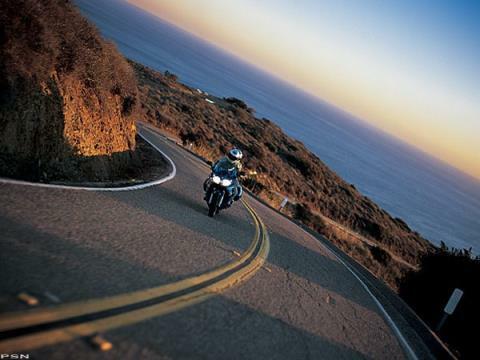 The FJR1300 moves so well, it may leave less time for taking in the scenery. The 6.6-gallon fuel capacity means you might not discover as many quaint gas stations. And, you may attract more hangers-on, so accommodating are the broad and supportive dual-density seat, excellent grab handles and cavernous storage. Life consists mainly of compromises. Some rare times, though, you really can have it all. Highly aerodynamic full fairing is highlighted by an electrically adjustable windscreen that can be easily raised for greater wind protection or lowered for a sportier profile via a handlebar-mounted switch. Equally sleek tail section helps reduce drag and features a sturdy rear luggage rack/passenger grabrail. Subframe-fitted quick-release luggage mounts provide easy use of the standard accessory side cases*, which are conveniently matched to the ignition key. Integrated color matched front turn signals add to the FJR1300’s cutting-edge aerodynamic bodywork. High-tech instrument panel delivers comprehensive display that includes an electronic analog speedometer and tachometer (both with a lightweight, R1-type step motor); LCD digital odometer, dual tripmeters, fuel and coolant temperature gauges, and clock; and lights for neutral, high beam, turn signals, low oil and engine warnings. Sleek, R1-type cat-eye dual 12V 60/55-watt multi-reflector headlight throws an extremely broad beam for superb visibility. Powerful dual-bulb taillight features integrated turn signals for a slick, one-piece look that’s as aerodynamic as it is conspicuous. Fairing pocket (located in the forward fairing panel) is convenient for small storage. *Accessory side cases as standard equipment. Soft case liners included. Oil Capacity (with oil filter change): 4.55 qt. Hollow cast-aluminum frame, featuring massive, widely spaced twin spars, is incredibly light and extremely rigid, the perfect combination for sharp, sportbike-like handling. Fully detachable aluminum subframe helps keep weight down while permitting easier rear shock access/maintenance. Lightweight, cast-aluminum swingarm’s unique design incorporates the shaft drive into its left side, ensuring superb rigidity with reduced unsprung weight that delivers incredible handling and suspension performance. Fully adjustable (preload, compression and rebound damping) 48mm Soqi front fork with 5.4" of travel provides quick, responsive steering with excellent rider feedback in a wide range of conditions. Adjustable (preload and rebound damping) 46mm link-type rear shock with 4.8" of travel features a handy, two-stage (hard/soft) preload adjustment lever that allows the rider to switch quickly between solo and two-up settings. Dual 320mm front disc brakes with YZF-R1-derived one-piece 4-piston calipers and 282mm rear disc brake with a slide-type dual-piston caliper provide outstanding stopping power with exceptional feel. Optional anti-lock braking system (ABS) allows for even greater wet-weather braking performance. Cast-aluminum 3-spoke wheels wear sporty-spec 120/70-ZR17 front and 180-50-ZR17 rear Metzeler radials perfectly suited to both spirited solo riding and long-range trekking. Adjustable, 5-position front brake lever. Compact, lightweight 1298cc, DOHC, 16-valve, liquid-cooled in-line four-cylinder engine delivers massive power and torque (145 hp @ 8000 RPM and 99 ft.-lbs. of torque @ 7000 RPM, respectively) for an unequaled spread of muscle over a wide RPM range. Compact slant-block engine design uses stacked, tri-axis gearbox shafts that help minimize powerplant size while optimizing chassis geometry for a low center of gravity and balanced weight distribution. High-compression four-valve cylinder heads are operated by compact, side-driven double-overhead camshafts, and for strong, dependable high-rpm performance the plated cylinders feature oversquare dimensions of 79 x 66.2mm. Advanced fuel injection (FI) system is ideal for long-distance supersport-touring, delivering crisp, seamless throttle response in a variety of altitude/weather conditions and enhanced fuel efficiency and instant, choke-free starting. FI system features TPS, which monitors throttle position and, with a battery of sensors (air intake temperature/pressure, atmospheric pressure, coolant temperature, crankshaft position and engine rpm), ensures precise injection intervals and timing for optimal performance. 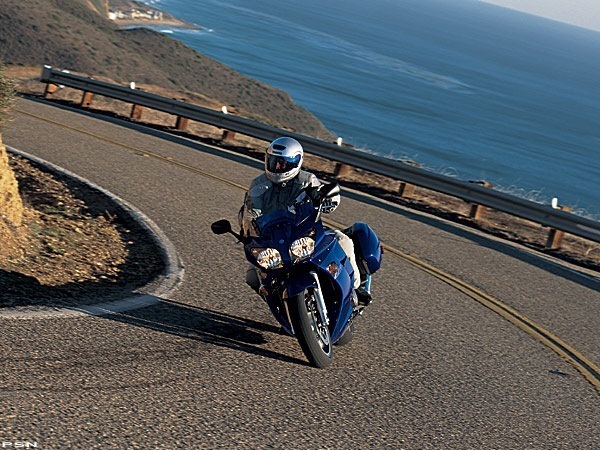 Low-vibration crankshaft features two gear-driven secondary counterbalancers with built-in shock absorbers that help deliver a glass-smooth ride with reduced rider/passenger fatigue. Light-action hydraulic multi-plate wet clutch provides smooth, effortless shifting, minimizing both rider fatigue and maintenance. Shaft final drive system is super-durable and virtually maintenance-free, and uses mechanical cam dampers in its drive pinion for quiet, smooth power delivery to the rear wheel. 4-into-1-into-2 stainless steel exhaust optimizes engine performance across the powerband and features a three-way catalytic converter and Air Induction System, making this one of the cleanest-running large-capacity motorcycle engines ever built. Wet-sump oil system uses an easy-access cartridge-type oil filter mounted on the engine’s left side.